The worst thing about fresh fruit is the darn fruit flies. I know, because we've been hit - arg! I'm not one to tolerate bugs or insects of any variety in my home. Especially having just been battling with the icky Box Elder Bugs this fall. So first I grabbed a left-over roll of the sticky fly tape. My complaints spurred on the hubby who went and created The Farm Version Of The Fly Trap. This trap is based on the bait method; a bit of fruit juice in the bottom of a clear glass jar (another excellent reason to keep baby food jars! ), with a funnel of paper taped at the opening. You can modify this by using wine, sugar water, etc. -- any sweet and fermenting liquid will work. The theory behind this natural method of ridding your house of fruit flies is that the flies will be lured to the sweet stuff, flying into the wide opening of the paper funnel mouth but, as the end narrows near the liquid, they will land in the liquid and drown. The fruit flies we had seemed to not only survive the death trap (including, when one did manage to die in the juice, other fruit flies standing upon the dead body of their fallen comrade to partake of the juice), but thrive. 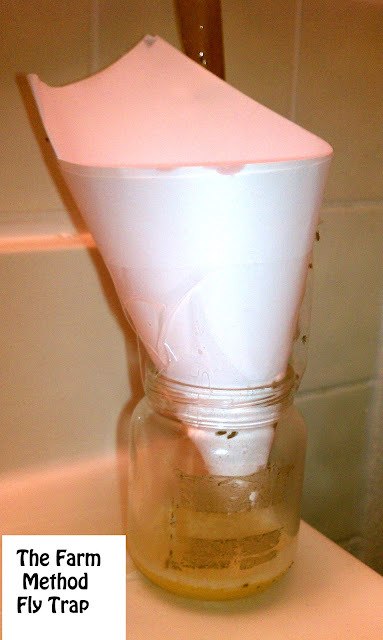 Yup, after two days of watching the damn things walk around inside the jar, I concluded that The Farm Method of fruit fly removal was more like feeding and perhaps breeding than ridding us of the pests. Seriously, other than my concerted efforts to spot them near the tape and smush or imprison them, they seemed to proliferate. I again brought hubby into the bathroom, told him my (obsessive) observations, and asked him if he had any modifications up his sleeves. When the answer was, "Nope," I has him disassemble the contraption and just left the store-bought fly paper roll there and tried to ignore it all. While The Farm method sure looks better than a long unwound roll of sticky tape with dead insects on it, it just didn't work. And while you can argue that The Farm method is more natural, and/or, pending on the manufactures of all the items in question, more environmentally friendly, I myself just wish to be rid of the icky insects. Farm method modified: apple cider vinegar with a drop or two of dish detergent. Cover tightly in plastic wrap, punch a few small holes in the plastic with a fork. The dish detergent changes the viscosity of the liquid making them more likely to drown. The holes in the plastic wrap are one way streets for them, so the few that don't drown, are at least trapped. Usually a day or two of having this set up on the counter solves my fruit fly problems. Hehe, you might want to try a smaller opening in a bottle or beer can, that way they can't find their way out as easily! 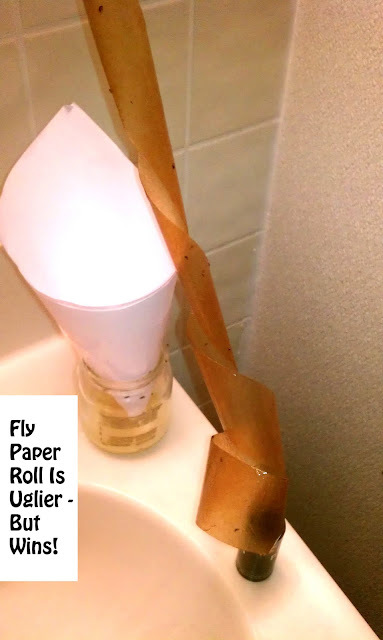 But I agree, the fly paper is ugly but it sure wins in usefulness than looks. (My husband likes to have them hanging in the kitchen! :P) BTW, we received the 50s BBQ book, we are cracking up over the page that talks about using an abestoes lined glove when grilling...wow! Thanks so much again! I have tried the fly paper, and it has worked - after a while. But, this last infestation has been stubborn. I am trying Nicole's suggestion. I put it out last night. I haven't checked to see if I caught any yet, but I hope I do! I use Nicole's method..it works great! Update: I used Nicole's method. At first I was upset because I didn't cat anything. Then I found one floating in the cup. After a few days, the fruit flies were gone. Thanks! !